Dr Angie Ma - Dr Angie Ma is the co-founder and COO of ASI Data Science. Since being founded in 2014, ASI Data Science has completed more than 100 commercial data science projects in multiple industries and sectors and is regarded as a leading data science company in Europe. Along with building the world's best data science platform, SherlockML, ASI also runs a Fellowship for PhD's and Post-Doc's, to help them become data scientists. Angie is passionate about applying AI to solve real world applications that generate business value for companies and organisations. 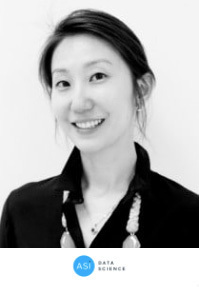 Prior to founding ASI Data Science, Angie, who has a PhD in Physics, was a researcher in nanotechnology working on developing optical detection for medical diagnostics.